For the entire month of January, Chemo Duck will receive a portion of the proceeds from sales from The Hope Market – an online shopping site featuring accessories like necklaces, headbands, hair ties and shirts. The market is a part of Headbands of Hope, founded by Jessica Ekstrom in 2012. It was during a college internship that Ekstrom noticed a need for providing headbands to children undergoing cancer treatments. For every item purchased from Headbands of Hope, a headband is donated to a child with cancer and $1 is donated to a childhood cancer organization of the customer’s choice. As word of the company spread, so did Ekstrom’s interest in helping pediatric cancer patients on a larger scale. “Going to hospitals to donate headbands has given us a lot of insight to the needs of the facilities and the families of kids with cancer,” she said. “The Hope Market is our way to fulfill those various needs. Chemo Duck was an easy fit for the company’s charitable giving focus, she said. Headbands of Hope is not just for girls. 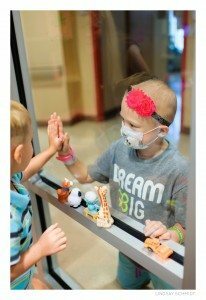 A boys line of buffs has been a huge hit, she said adding that the newest accessory allowed the company to cater to all childhood cancer patients.